1 This option to be exercised where there are Non-empanelled Hospital/Remote Areas. (a) Acute cardiac emergencies: like chest pain, arrhythmias, congestive cardiac failure. (b) Acute Respiratory emergencies: Severe Respiratory distress. (c) Neurological emergencies: Stroke, seizures, acute paralysis, acute visual loss, cerebra-meningeal infections etc. (d) Acute pain abdomen, acute obstetrics and gynecological emergencies. (e) Acute kidney failure, Dialysis for kidney in chronic kidney diseases Patients. (f) Acute endocrine emergencies: diabetic ketoacidosis (Very high blood sugar level), Hypoglycemia (Very low blood sugar level). (h) Any life threatening emergencies: road traffic accidents, head injury, multiple injury, crush injury, burn injuries etc. (j) Acute limb ischemia, medical and surgical shocks. (k) Heat strokes and cold injuries of life threatening nature. (j) Acute poisoning & snake bite. (m) Any severe infection leading to life threatening conditions: Septicaemia. You could claim the amount as per CGHS rates as an individual reimbursement through the Polyclinis(PCs) and get as per Non-NABH rates (NABH means super speciality hospital). – All Govt hospitals deemed empaneled. – Regional Cancer Centres also listed out. – Reimbursement will be full at hospital rates and not CGHS rates. – Referrals from Polyclinic required for claim. – Only deduction would be the BPA fees. 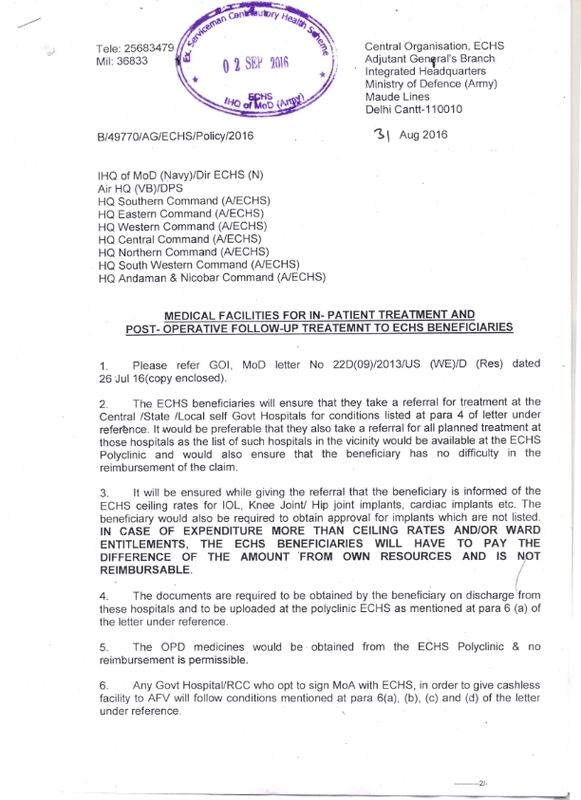 – OPD Medicines still to be taken from ECHS Polyclinic. But any purchase of NA medicine post discharge up to 01 month reimbursable ( as per a another policy guideline). 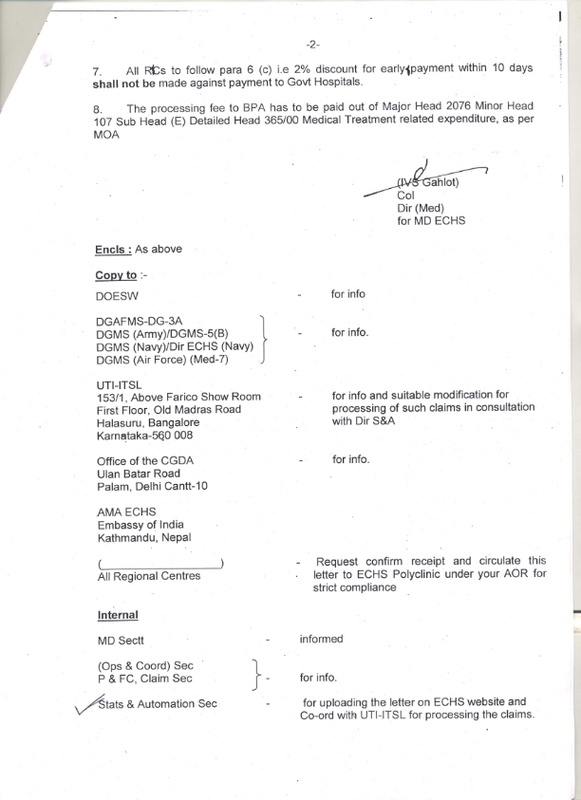 If the Govt hospital has MOA with Regional Centre ECHS, then the treatment is cashless.